The popularity of carol services has continued to grow since the late 1800s. One early carol service is the Festival Of Nine Lessons and Carols, which was first celebrated December 24, 1880 at Truro, Cornwall, England by Rev. G. H. S. Walpole, later the Bishop at Edinburgh, and Bishop Edward White Benson, later the Archbishop of Canterbury (1883). The first Festival was conducted at 10 p.m. on Christmas Eve under the conductorship of the Vicar Choral, Rev. Walpole, and the Organist, Mr. William Mitchell. According to Ray Robinson, prior to 1878, the church choir had the practice of caroling throughout the community, singing carols at the residences of the members of the congregation. But at the request of leading parishioners and others, "an ordinary carol service" was instituted in 1878, and in 1880 the Festival of Nine Lessons and Carols was initiated. At that time, the old St. Mary's Church was in severe disrepair, and had been largely demolished. A wooden structure was erected to serve as the parish church until the new Cathedral could be built. Not quite a "wooden hut," the structure was large enough to hold 400 parishioners. According to A. C. Benson, "My father arranged from ancient sources a little service for Christmas Eve — nine carols and nine tiny lessons, which were read by various officers of the Church, beginning with a chorister, and ending, through the different grades, with the Bishop." The service also included a sermon. The next year, The West Briton reported that "The Cathedral was crowded, many Nonconformists as well as church-goers being present." As would be the case in the King's College Festival, the musical climax came at the Ninth Lesson, here with the Messiah Chorus and the Magnificat. They organized the readers to form another sequence, climbing upward from the rank of chorister to the Bishop himself. Other sources also note the involvement of Rev. Walpole in these innovations. On Christmas Eve 1918, the Truro service was adapted for use in the Chapel at King's College of Our Lady and St Nicholas in Cambridge, which was founded and endowed in 1441 by King Henry VI. The 1918 service was not altogether successful, and the Order of Service was revised for 1919. This consisted of a rearrangement of lessons, an adjustment of the music, and the creation of the now-famous Christmas Bidding Prayer. Since then, the lessons and the prayers have remained virtually unchanged. See: History Of The Service. In March, 2007, I was privileged to receive a copy of the 1936 program of the Festival "On Christmas Eve," of which only 250 copies were printed. The beautifully illustrated volume was produced under the direction of Leonard Jay by the students and teachers at the City of Birmingham School of Printing (a department of the Central School of Arts and Crafts, Margaret Street). The page at left is of the Fifth Lesson, and shows the lettering and illustrations found in this volume. The 1936 program was substantially the same as that heard in 2000 (see below), although the Bidding Prayer had significant variations, and The Collect was completely different. Of the Lessons, all were the same except the Fourth Reading (which was from Micah 5:2-4) and the Sixth Reading (which was from Matthew 1:18-23). The 1936 version omitted the last sentence of the First and Eighth Lessons. With only two exceptions,3 the selection of carols varies from year to year. See: Carols and Hymns from the Festival Of Nine Lessons and Carols (1997-2006, plus the carols and hymns from 1918, 1936, 1937 and 1957). Carols are changed and new ones have been introduced according to the tastes of the Organists at the College: Arthur Henry Mann (1876–1929); Boris Ord, 1929–1957; Harold Darke (Ord's substitute during the war), 1940–1945; Sir David Willcocks, 1957–1973; Philip Ledger, 1974–1982 and, since 1982, Stephen Cleobury. Cleobury (1948 - ) was an organ scholar at St John's College, Cambridge, under George Guest, and sub-organist of Westminster Abbey before becoming Master of Music at Westminster Cathedral in 1979. In 1982 he was appointed Director of Music for the Choir of King's College, Cambridge, where he also teaches. He has been conductor of Cambridge University Musical Society (CUMS) since 1983. In addition, he was Chief Conductor of the BBC Singers from 1995 to 2007, until succeeded by David Hill. Since his appointment to King's Mr. Cleobury has commissioned a new carol for each year's Festival. Many of these new carols are found on the CD "On Christmas Day: New Carols from King's Choir of King's College, Cambridge"; it was released by EMI in 2005. Some are also included on the CD "One Star, At Last: A Selection of Carols of Our Time," performed by the BBC Singers under the direction of Stephen Cleobury. It was released by Signum UK in 2005. But although the selection of carols changes from one year to the next, the order of service, the prayers, and the readings generally remain constant. The reason for this is that the heart of the service is the readings. "It's a service, not a concert," the music office of King's College emphasizes. As Rev. Milner-White observed, "The main theme is the development of the loving purposes of God, seen through the windows and words of the Bible." The purpose of the carols, he continued, is to amplify and reinforce the message of the scriptural readings. The popularity of the Festival has spread throughout the world, due in no small part to the British Broadcasting Company. The Christmas Eve Festival was first broadcast by BBC radio in 1928 and 1929, and annually since 1931. In 1954, a special taping of the entire service was prepared for television; since 1963 edited tapings have been periodically televised. Today, millions of people around the world hear or see the Festival which is broadcast by the BBC radio, television, and short-wave beginning at 3 p.m. (1500 GMT). Radio and television stations in many countries rebroadcast the service, including several hundred American Public Media radio stations in the United States (not to be confused with the Public Broadcasting System, PBS). It is also streamed via the Internet (BBC4: http://www.bbc.co.uk/bbcfour/). It is also rebroadcast on the BBC's Radio 3 on Christmas Day. Note that the Americas no longer have a directly-beamed BBC short-wave signal. Recordings of past Festivals are also available at the King's College Chapel Shop, at Amazon.com, and elsewhere. There are also recordings of Festivals from other locales, such as that from St. John's Episcopal Cathedral, Denver, Colorado: "A Festival of Nine Lessons and Carols" (Donald Pearson, Organist and Choirmaster, 1998). Additional resources are listed on the Christmas Music page. If you would like to fashion your own version of this service, you may wish to visit the Nine Lessons and Carols page at King's College, Cambridge. There you can find the text and carols to all services since 1997, either in HTML or PDF formats (or both in some cases). In addition, on this website are texts of the prayers and lessons from the Festival: Readings for a Festival of Nine Lessons and Carols. That page also contains links to recordings of the prayers and lessons of the Festival. The text has been used by kind permission of the Provost and Fellows of King's College. Please do not use the text or recordings for any commercial gain. Christmas Music (MP3s and sheet music) at Sally DeFord Music. Garritan Community Christmas. Three CDs worth of free MP3 downloads. LibriVox: Christmas Carol Collection 2006. A dozen traditional Christmas carols recorded by LibriVox volunteers. And see the following sources for texts, or the order of service, or both. Jacques and Willcocks, Carols for Choirs 1: Fifty Christmas Carols . London: Oxford University Press, 1961. Contains the text of the Nine Lessons, plus alternates. Willcocks and Rutter, Carols for Choirs 3. Carols for Choirs . London: Oxford University Press, 1978. This resource contains a page of suggested poetic readings; see also Christmas Poetry And Prose that now contains over 300 poems. Willcocks and Rutter, Carols for Choirs 4: Fifty Carols for Sopranos and Altos . London, Oxford University Press, 1980. A listing of the Nine Lessons, and alternates (but not the texts themselves), together with the appropriate Collects. Willcocks and Rutter, 100 Carols for Choirs . London: Oxford University Press, 1987. A listing of the Nine Lessons, and alternates (but not the texts themselves), together with the appropriate Collects. As noted above, on this website are texts of the prayers and lessons from the Festival: Readings for a Festival of Nine Lessons and Carols. That page also contains links to recordings of the prayers and lessons of the Festival. Edward P. Mason, Two Responsive Carol Services (For Christmas and Easter). Boston: Oliver Ditson, 1883. J. E. Trowbridge, Responsive Christmas Carol Service for Sabbath Schools (Ditson, 1883). J. F. Kinsey and John McPherson, Echoes of Glory. LaFayette, IN: The Echo Music Co., 1888. A Christmas Programme - 1888. Richard R. Chope, Carols For Use In Church London: William Clowes & Sons, The Complete Edition, 1894: Six Carol Services for Christmas. Chope also had two services for Easter and three services for Harvest. Charles L. Hutchins, The Child Jesus (Medford, MA, prior to 1892). One of several carols services written by Rev. Hutchins, one other of which was a Christmas service (The Christ Child). A Festival Service of Nine Lessons And Appropriate Music. London: Oxford University Press, 1934. Based on the Christmas-tide A Festival of Nine Lessons and Carols at King's College, this service was adapted by the Winchester Diocesan Choral Association to embrace all the seasons of the Church's year. Erik Routley, The English Carol (New York: Oxford University Press, 1958), pp. 227 et seq., and Appendix 1 that includes orders of service at Truro and Addington, plus the order of service at King's College from 1918, 1937, and 1957. Appendix II contains a service of lessons and music for Lent. As this source is under copyright, the carol service is not reproduced here. Paul Thomas, "The Road To Bethlehem: A Service of Nine Lessons and Carols," with music by Michael Praetorius (1571-1621) (St. Louis, MO: Concordia Publishing House, 1962, 1990). In the form of the King's College service, Mr. Thomas states that this service can be used anytime during the twelve days of Christmas. Richard Tatlock and Desmond Ratcliffe, The Story of Christmas. A New Presentation of the Festival of Nine Lessons. Sevenoaks: Novello, 1973. This version of the Festival envisions the use of a narrator instead of the usual nine readers. In addition, the text read by the narrator has been converted into blank verse of varying meters. Each lesson is followed by a carol or hymn (and alternative), and the service concludes with Collects and the Blessing from the Missal of Leofric (Leofric (1016-1072), First Bishop of Exeter, 1050-1072; note that the missal is in Latin). Hal H. Hopson, A Festival of Lessons and Carols. Van Nuys, CA: Alfred Publishing Co., 1997. As described, following the order of the King's College Festival, with arrangements by Hopson. Hal H. Hopson, Sing Noel! A Carol Service. Van Nuys, CA: Alfred Publishing Co. A service of music and readings celebrating the birth of Christ. The traditional scripture lessons have been replaced by poetry, some familiar, others less so (although not for lack of their beauty). The Nine Lessons of Messiah's Birth,, Byrneville United Methodist Church, December 23, 2001 (http://www.jacksonsnyder.com/arc/New%20Century%204/Nine%20Lessons%20and%20Carols.htm; accessed March 25, 2007). An example of a local adaptation of the King's College Festival. Reformed Church of America. Numerous Advent, Christmas and Epiphany resources. There are additional details on the page titled "Notes On The Use Of Carols" (p. 447 of my copy, the 1964 edition). In recent years, the Advent Carol Service has also gained in popularity, in part to re-emphasize the spiritual value of the Advent season which must each year compete with the onslaught of commercial messages (and has, for dozens of decades; we're not the first to have to undergo this annual gauntlet!). In the old English liturgies, the Advent Offices made a preparation for the coming of our Lord to this earth far more vivid and eager than those of our present Prayer book. So an Advent Carol Service, if without precedent, is not without suitability, if it helps to express "the desire of all nations and ages." The purpose of the Service, he wrote, was "not to celebrate Christmas, but to expect it". Carols for Choirs 2: 50 carols for Christmas and Advent, together with a suggested service (following the Appendix). Willcocks and Rutter, Carols for Choirs 2: Fifty Carols For Christmas and Advent . London: Oxford University Press, 1970. Advent for Choirs: 52 selections, with a Liturgical Introduction that discusses Advent services in general, plus a Thematic Index of readings and music for up to eight Advent services. Malcolm Archer and Stephen Cleobury, Advent for Choirs. Oxford: Oxford University Press, 2000. The Highland Shepherd has a great wealth of information concerning Advent and Christmas Festivals (and other seasons as well). In particular, see Choral Services for the Season (http://www.msgr.ca/msgr-2/choral_services_for_the_season.htm). Many find the use of the Advent Wreath to be a helpful starting point to focus on the themes of the Advent season. See: Advent Candles: the Wreath and the Lighting of Candles (http://www.msgr.ca/msgr-2/advent_candles.htm), and Advent Wreath: prayers and readings for home (http://www.msgr.ca/msgr-2/advent_wreath.htm). See generally: Festivals of Light (http://www.msgr.ca/msgr-2/Advent_Hanukkah_Christmas_Epiphany.htm). All pages accessed March 26, 2007. The BBC reproduced the Advent Carol Service programs for 2004, 2005, 2006 and 2007 from the Chapel of St John's College, Cambridge. Although the 2006 page indicated that the service could be heard for only seven days following its initial posting, I was able to listen to the 2006 service on March 26, 2007. Here's the link to the BBC Player for this service: Advent Carols (http://www.bbc.co.uk/radio/aod/radio3_aod.shtml?radio3/adventcarols). I've read that the BBC has broadcast the Advent Carol Service each year since 1981. I do not have access to any of the texts recited during this service. It is said, but I have not confirmed, that some modern service books contain suggested Advent and Christmas carol services. As my collection is almost exclusively of hymnals, rather than service books, I'm unable to make any recommendations. The closest I could come was three brief services from The Hymnal For Worship & Celebration (Waco, TX: Word Music, 1986). One service was titled "The Advent Of Our Lord - A Brief Service of Joyful Expectation." It contained a brief poetic introduction ("We Shall Come" by Mary E. Caldwell), followed by three carols: O Come, O Come, Emmanuel; Come, Thou Long-Expected Jesus; and Joy to the World! It is found at 122-125. The second service is "Gloria In Excelsis Deo - A Brief Service of Proclamation and Praise." Following a brief introduction (Luke 2:8-14), three carols are sung: Angels From The Realms of Glory; Angels We Have Heard on High; and Hark! the Herald Angels Sing. See 130-133. The third service was "For Unto Us A Child Is Born - A Brief Service in Celebration of Our Lord's Birth." Again, it contained a brief introduction (Matthew 1:18-23), followed by four carols: Infant Holy, Infant Lowly; How Great Our Joy! ; O Come, All Ye Faithful; and For Unto Us A Child Is Born. See 142-146. For those seeking Christmas poetry in the creation or augmentation of their services, please see Christmas Poetry And Prose. A final published festival to be noted is Hal H. Hopson's A Festival of Hymns: The Writers Tell Their Stories (Miami, FL: Warner Bros. Publications, 2000).This unique festival service features eleven significant hymn writers through the ages, from the 4th to the 20th centuries, telling their own stories in the first person, followed by one of their hymns. I have also found ChoralNet to be an excellent source (helpful hint: enclose search phrases in quotation marks). The Christmas Story In Six Lessons With Nine Carols Sung By The Choir Of Westminster Abbey, London: Fabbri & Partners Limited, 1969. Large paperback with 10" LP record. If you can provide additional information (or, *gasp* correct an error! ), please . 1. The source for this information was a letter by Ray Robinson, "A Postcard from Cambridge: Personal Impressions of Life at an English University" on the topic of "The Festival of Nine Lessons and Carols," dated December 2002. This was letter six in a series with similar titles. This file was, for a time, available on the Internet, but I was unable to locate it when I searched on March 25, 2007. This page seems to be an excerpt from (or perhaps a prelude to) his article "The Service of Lessons and Carols," Choral Journal (American Choral Director's Association), December 1990, pages 13-20. Notes from that article supplement those from the "Postcard." 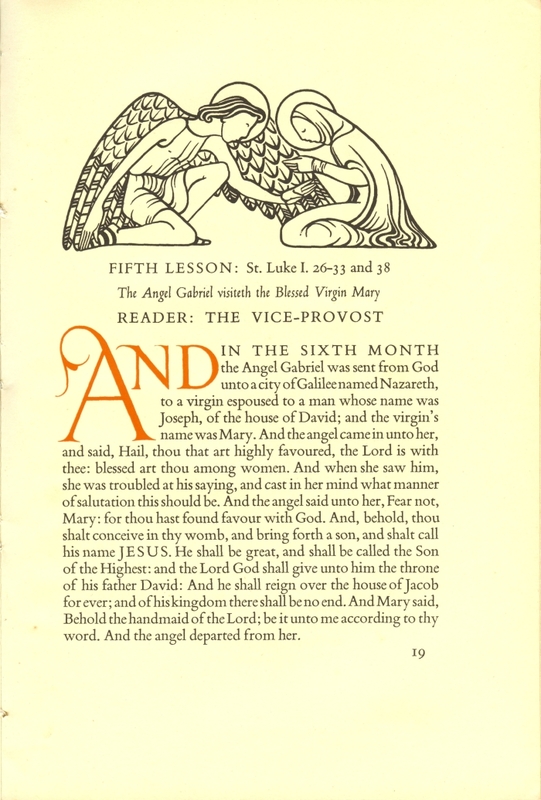 The Festival of Nine Lessons And Carol As Celebrated On Christmas Eve In The Chapel Of King's College, Cambridge . New York: Universe Publishing, 2004. Christmas is a wonderful, cheerful holiday. Whether we spend it by a real tree or some Balsam Hill artificial Christmas trees, at the end of the day what matters is that we enjoy our time together with our loved ones.